When experimenting with the concept of making Linux tutorial and review videos. A couple of weeks ago I introduced you to Vokoscreen which can be used to create Screencast videos. After creating a video with Vokoscreen you might wish to edit the video with Kdenlive to add titles or snip bits that don't fit or to add a music overlay. 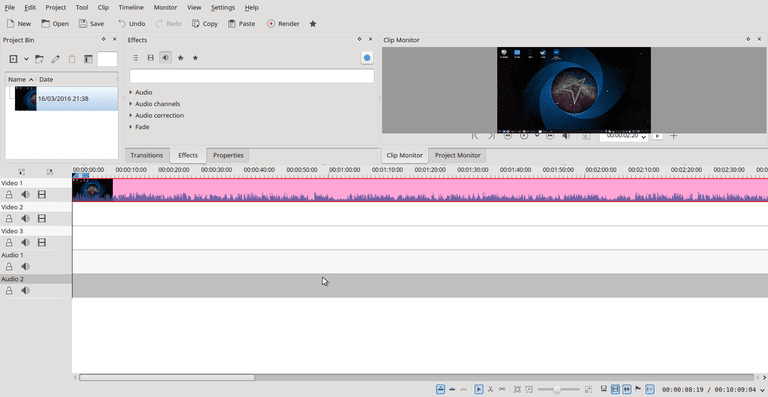 In this guide, I am going to show you the basic features of Kdenlive so that all of you budding Youtubers can add the finishing touches to your videos. Before I start I want to add that I have only just dabbled with the concept of making videos and therefore I am no expert on the subject. There is a dedicated channel for making videos. Generally, you would use Kdenlive on a distribution that runs the KDE desktop environment but you don't have to. If you receive a permissions error whilst running these commands then you will need to elevate your permissions using the sudo command. There is a screenshot of the main interface at the top of this overview guide. A menu appears at the top with a toolbar underneath. The left panel is where you load all the clips you wish to use as part of your project. Underneath the left panel is a list of video tracks and an audio track, these can be customized and I will show you how shortly. In the middle of the screen is a tabbed interface where you can add transitions, effects and adjust video properties. Finally, in the top right corner, there is a clip monitor which lets you view the video. You can create a new project by clicking on the new icon on the toolbar or by choosing "File" and "New" from the menu. The setting tab lets you choose where your final video will be stored, the type of video and the frame rate. You can at this point also choose how many video tracks you will use and how many audio tracks you want to add. There is a huge list of video types to choose from and many of them in HD format. The trouble with HD format video is that it uses a lot of processor power. To aid you with that you can choose to use proxy clips which let you create the video and try it out in the editor using a lower resolution video but when creating the final release the full video format is used. The metadata tab displays information about your project such as the title, author, creation date etc. Finally, the project files tab lets you choose to delete unused clips, remove proxy clips and clear the cache and is used more when opening a file than creating a new one. To add a clip to the project right click in the left panel and choose "Add Clip". You can now navigate to the location of a video clip that you wish to edit on your computer. If you don't have any video clips you can always download some using the Youtube-dl software and create a mash-up video. When you have added video clips to the panel you can drag them onto one of the video timelines. You might want to add a color clip to the project to denote the end of the video or to denote a change in sequence. To do so right click on the left panel and choose "add color clip". You can now choose the color for the clip from a preset list or choose a custom color using the color grid. You can also set how long the clip will run. To add the color clip to your video timeline drag and drop it into position. If you overlap videos so that they are on different timelines but occupy the same time period then the video at the top takes precedence over the one underneath. If you have taken lots of holiday snaps and you want to create a slideshow video with you talking over the top then right click on the left panel and choose "add slideshow clip". You can now choose the file type and the folder where the images are located. You can also set how long each image in the folder is displayed for and add a transition effect to the next slide. Incorporate this with a nice soundtrack and you can replay those holiday memories or that third cousin twice removed's wedding that you went to in 2004. The most obvious reason to use Kdenlive to edit your video is to add a title. To add a title clip right click on the left panel and choose "Add Title Clip". A new editor screen appears with a chequered display. At the top is a toolbar and on the right a properties panel. The first thing you will probably want to do is fill the page with color or add a background image. If you have already used GIMP to create a good image then you might choose to use that instead. The top toolbar has a selection tool for selecting and moving objects around. Next to the selection tool are icons for adding text, choosing a background color, choosing an image, open an existing document and save. To fill the page with color choose the background color icon. You can now choose a color for the background color and a border color. You can also set the width of the border. To actually add the color either enter a width and height or drag across the page. Be careful it is very rudimentary and easy to get wrong. To add an image click the background image icon and choose the image you wish to use from a folder. Again the tool is fairly basic so it is worth getting the image to the right size before importing it into Kdenlive. To add text, use the text icon and click on the screen where you wish the text to appear. You can adjust the text size, color, and font as well as specify the justification. On the right side of the screen, you can adjust the length the title is displayed for. You can add many objects to the title page. You can adjust whether one appears on the top or bottom of another by adjusting the aspect ratio. When you have finished creating the title clip press the "OK" button. You can save the title page as well by clicking the relevant icon. This enables you to use the title page again for other projects. To add the title clip to your video drag it to the timeline. You can preview any of the clips you have loaded in before adding them to the timeline by clicking them and pressing the play button on the "Clip Monitor" tab. You can preview the video you are editing by clicking on the "Project Monitor" tab and pressing the play button. You can preview different parts of the video by adjusting the position of the black line on the timelines. If you want to split a long video into smaller segments so that you can rearrange them or remove bits move the black timeline to the bit you want to cut, right click and select "cut". You can then drag the video bits to make them larger or smaller. If you wish to delete a section of a clip right click and choose "Delete Selected Item". You can switch from one clip to another with nice transition effects. To add transitions you can either click the transitions tab and drag the transition to the timeline or you can right click on the timeline and choose to add the transition from there. For the transition to work properly the video clips need to be on separate tracks and you can make the transition last longer by dragging it to the right. To add effects click on the effects tab and choose the effect you wish to use and drag it to the appropriate timeline. For instance, if you want to add music over a news clip and remove the voices from the news clip you can choose to mute the sound. To create the final video click on the "Render" toolbar icon. You can now choose where to put the final video. For instance, you can choose your hard drive, a website, a DVD, media player etc. You can also choose the video type that you want to export the video to, the video quality, and the audio bitrate. When you are ready click "Render to file". The job queue will now load and you will see the current progress. As well as rendering the video you can choose to generate a script. This allows you to render the video in the same format again and again by choosing the script file from the scripts tab. For a full manual visit https://userbase.kde.org/Kdenlive/Manual. How Do You Split a Video Clip in iMovie?